Finally, I have managed to complete my cards based on Joanne Wardle's lovely examples in the October issue of Craft Stamper magazine. I haven't been well, and then with the Christmas rush, my Blog assignment just didn't stand a chance. However, I have manage to complete them, and here they are! I have used Nestability dies to create my shapes on each of my cards, picked some of my favourite silhouette stamps and combined them with some of my favourite ink colours. My first card uses a gorgeous thistle type flower from Lavinia stamps, and a little dragonfly. I wanted to echo the spiky feel of the flower, and so I used an inverted scalloped circle Nestability. I used Antique Linen, and Chipped Sapphire Distress Inks, and Lulu Lavender and Sweet Plum Memento Inks to colour my shape. The second card uses a stamp from Stampendous, I love this stamp, often using it for sympathy cards. I wanted to use three circles in a lopsided fashion to incorporate all of the flowers. So, I stamped the image onto scrap card, and cut my template with the Nestabilities from this piece of card. After I had coloured my finished card, I then restamped my image, which enabled me to get the stamp in the correct place. I have a stamp positioner, but I just didn't want the fuss! 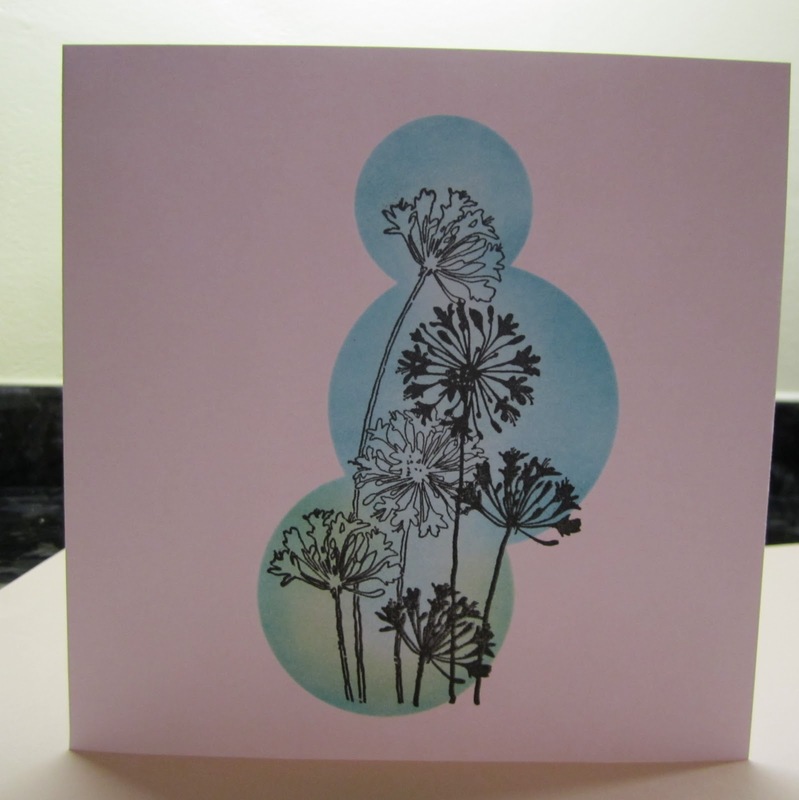 I used Tumbled Glass and Broken China Distress Inks and Juniper and Stream Adirondack Inks for this card. The third card uses Elusive Images stamps, which unfortunately you can't purchase at the moment. Hopefully they will be available again very soon. 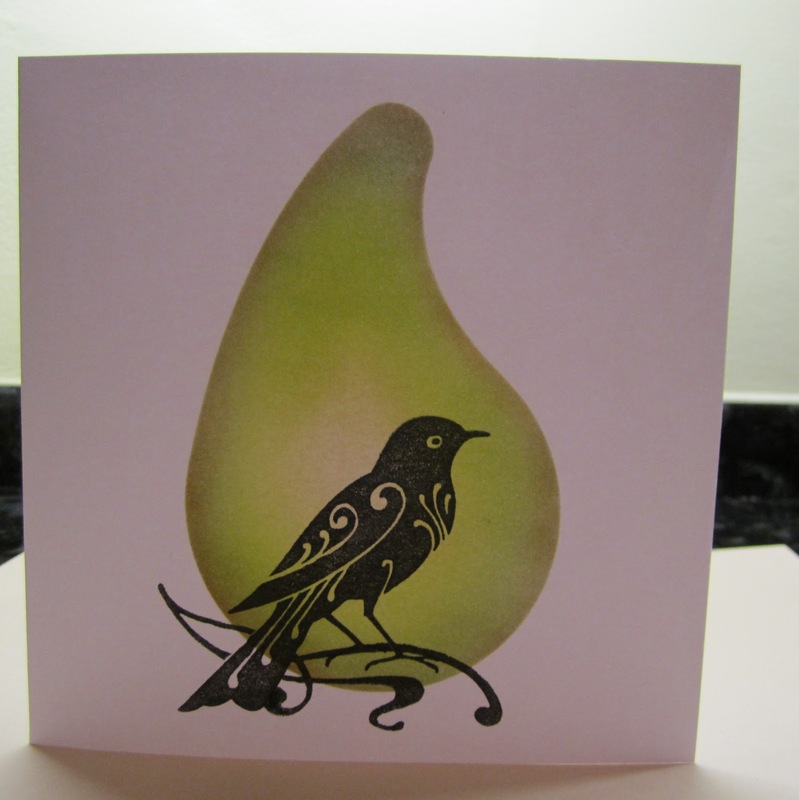 I have used a Paisley Nestability shape on this card, which reminds me of a teardrop. I used Antique Linen, Bundled Sage and Vintage Photo Distress Inks, and Pear Tart Memento Ink for my shape. I stamped the bird, masked him off, and then stamped the swirl. It's been a challenge keeping my cards simple, I was itching to add an embellishment, but I've really enjoyed the process. Thank you Lesley for choosing the project, and thank you Joanne for inspiring us in the first place. Well Judith, it was definitely worth the wait. I love the colour ways you have chosen - really lovely blending. It's great the way you have chosen such interesting nestie shapes too. All the stamps work perfectly. The way you have cut the three circles together is really clever and great positioning of the stamps. I love that little dragonfly! Looking forward to our next project! Judith, these are really lovely and they do feel quite different from the originals. Maybe your rounded shapes are just softer or maybe it is your choice of stamps but these are so pretty. I do like your choice of colours too. The Lavinia stamp is a seedpod from the Nigella (Love in a Mist)flower. My mum used to grow them. The flowers are a bit like a cornflower but the seedpods are fascinating too. 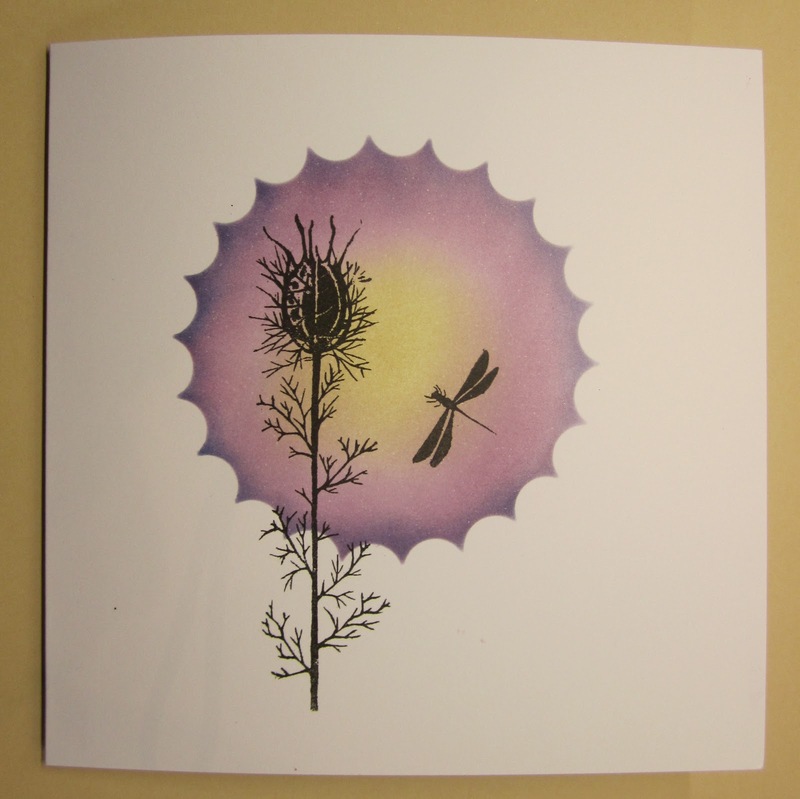 The stamp has made a really beautiful silhouette here and I think that is my favourite of these cards. A great end to our project this month. These are fabulous. I must give this technique a go. The October issue of CS is the one I didn't get!! lovely cards Judith, and quite different from the others too - you have all come up with something different, congratulations! What a fabulous finale to our CSQ year Judith! I love the interesting shapes you have used and the first one really hits the right spot for me. The inverted scalloped circle Nesties have never been on my wishlist till now especially as Ihave those stamps! The 3 overlapped circles work beautifully with the second pretty image along with the lovely colours and the third card uses some of my favourite colours and a subject image that has been one of my favourites for 2010. Well done for managing to finish the project whilst we are still in 2010 despite all the trials and tribulations of the past month. This was a post definitely worth waiting for my friend. What a wonderful take on the project, Judith. A great use of the Nesties. The first one in particular is absolutely gorgeous, so simple, yet so very effective. wonderful!! I absolutely love them, especially the middle one. it's such an honour to have been the original inspiration for these. I've so enjoyed seeing all of the pieces you ll made and look forward to seeing what you come up with next! These are really beautiful - love the unusual shapes.